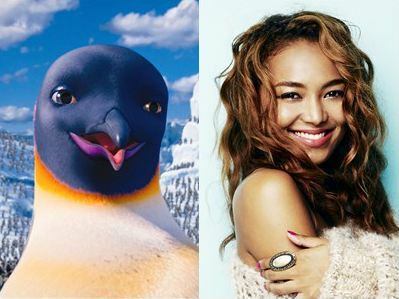 Crystal Kay to voice act for Japanese dubbed version of "Happy Feet 2"
It's been revealed that singer Crystal Kay will be voice acting for the Japanese dubbed version of the animated film, "Happy Feet 2". Crystal will be providing the voice for 'Gloria', the mother of the main character 'Erik'.�In the original movie,�P!NK is in charge of the voice and singing for 'Gloria'.�Crystal was chosen to play this part because of her reputation as a talented singer. For the movie, Crystal will sing Janet Jackson's "Rhythm Nation", Chaka Khan's "Ain't Nobody", and Queen and David Bowie's "Under Pressure" with Japanese lyrics. She expressed, "I want to do my best in singing and voice dubbing, while valuing P!NK's energy, and so that the Western hit songs won't be out of place in Japanese." As reported earlier, Suzuki Fuku will provide the voice for 'Erik', and Gekidan Hitori will be in charge of the voice for 'Mumble'. "Happy Feet 2" will hit theatres on November 26th in 2D and 3D. Tohoshinki announces new single, "Winter"